I just returned from a busy but fun filled week on the BIObus at the Pinery Provincial Park. 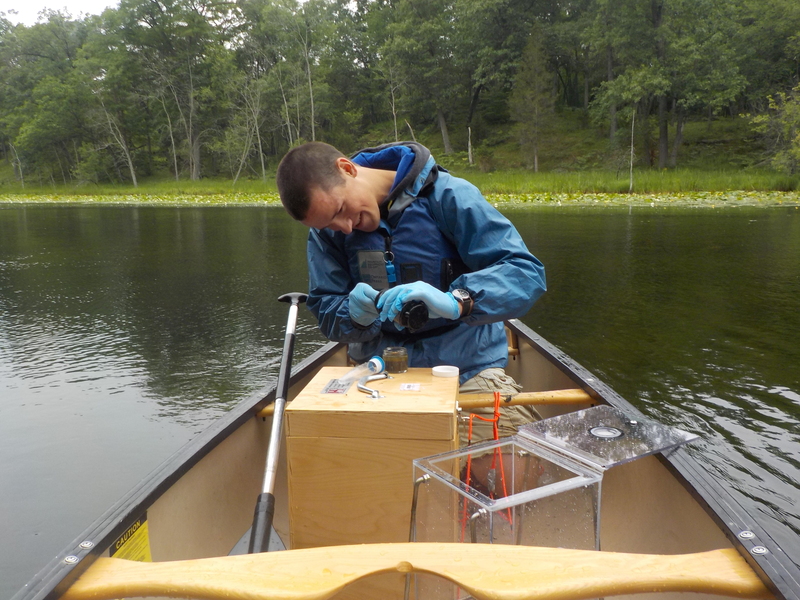 The main objective was to sample aquatic invertebrates and compile a bio-inventory for the Ausable Bayfield Conservation Authority (ABCA). 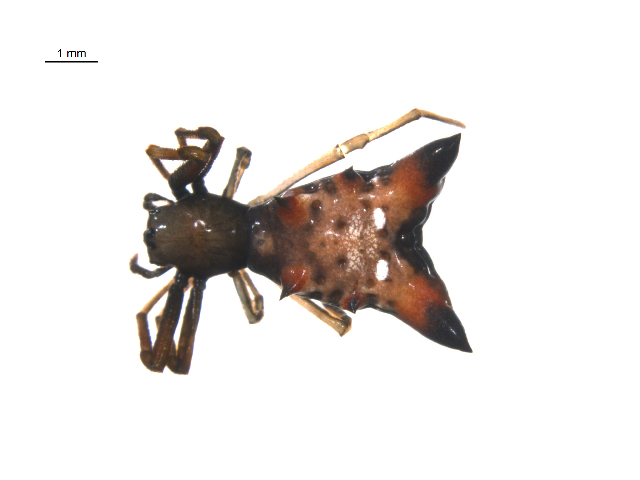 If you’ve been reading my earlier blogs you know that I’m keen on spiders, and fortunately, I was able to collect some interesting spiders in the ABCA. One unusual spider I found was the orb-weaving Arrow-shaped Micrathena (Micrathena sagittata). 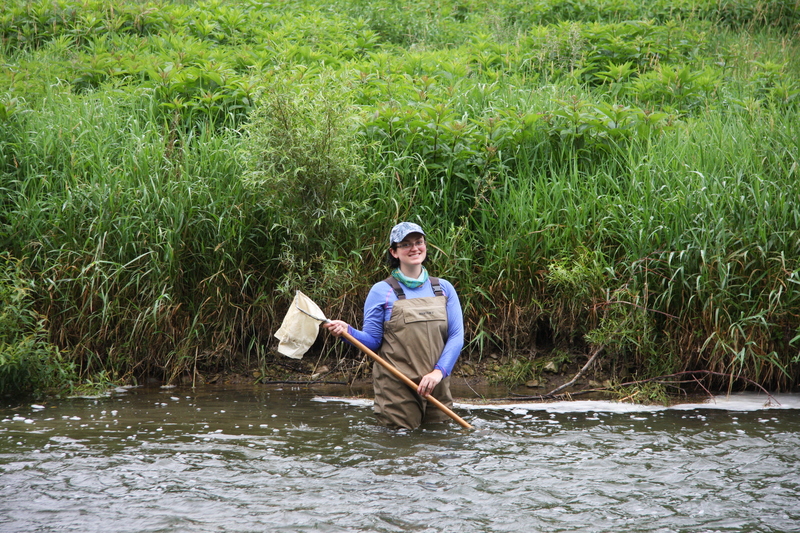 Although I was able to squeeze in some spider searching, most work days were spent sampling aquatic invertebrates. Two of the collection methods we used are called the plankton net and the S.P. (Schindler-Patalas) trap. Both of these traps are primarily used to capture zooplankton which is a group of tiny animals that live in the water and drift with the current. Zooplankton are so small that they’re invisible to the human eye. To get out in the water, my colleague and I rented a canoe and paddled along the Old Ausable Channel in the Pinery. After a few minutes of leisurely paddling, we threw the plankton net behind us and paddled for three minutes. The conical net collects zooplankton in a plastic jar and since the net is a mesh material, most of the excess water can drain out. We then drag the net back in and try to transfer all the zooplankton (which we can’t actually see) into a jar of ethanol. We repeat this process three times and if we’ve done everything right, we should see zooplankton under the microscope when we return to BIO. With the plankton net, we took a horizontal sample of the channel. But with the S.P. trap, we take a vertical sample of the channel. What we did is find a spot that is comparatively deep, and then we slowly fed the rectangular S.P. trap down into the water until it reached the bottom – counting the meters of rope let out as we go. The lid and bottom of the S.P. trap are hinged so that they will open while lowering the trap and close while raising the trap. This allows water to pass through the box so it can descend in a fairly straight fashion. Once we’ve hit bottom, we slowly drag the trap back up, this seals the top and bottom panels creating a very accurate and consistent volume of water sampled. 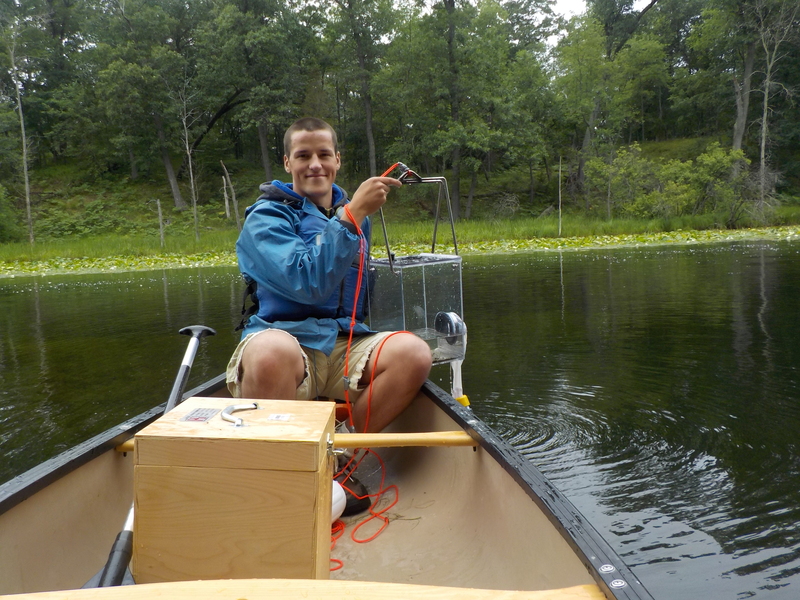 Pulling the trap up is pretty easy, except for when it comes above water; then it weighs a plank-ton! 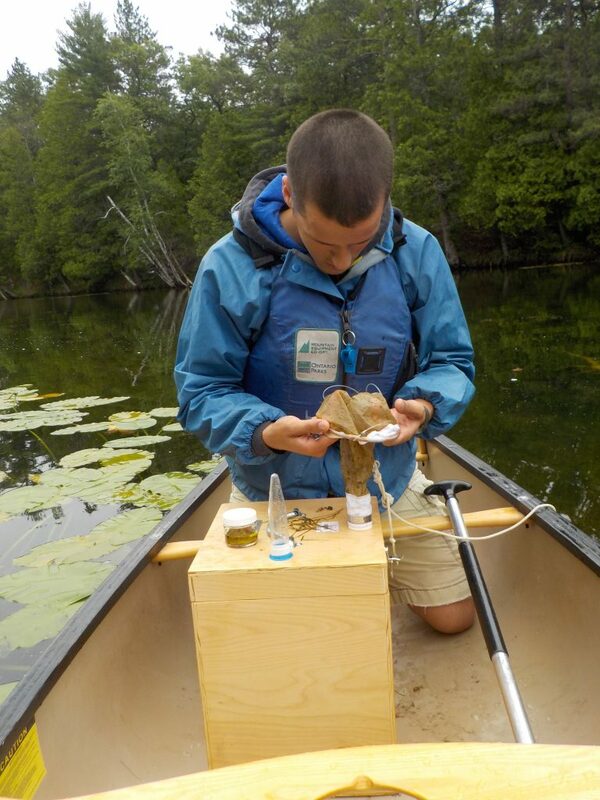 Again excess water drains out through a mesh sock, the sample with microscopic zooplankton is placed in a jar of ethanol, and this process is repeated three times. Despite being mainly concerned with aquatic invertebrates, we did quite a bit of sampling for terrestrial invertebrates. Unlike the super scientific plankton tow and S.P. trap, we did this part with regular dry mustard. The reason we use mustard is that it irritates the skin of terrestrial invertebrates like worms. In an attempt to get away from the irritation, they crawl to the surface where we can easily collect them. To do this type of collecting, we bring with us a square wooden plot which we place on the ground. If it’s present, we find a place with thick leaf litter and place the plot down; removing leaves and vegetation until the soil is exposed. After that, we use a trowel to loosen up some of the soil so it’s easier for the worms to move to the surface. We then pour a previously prepared mustard solution into a watering can so we can control our pours better. 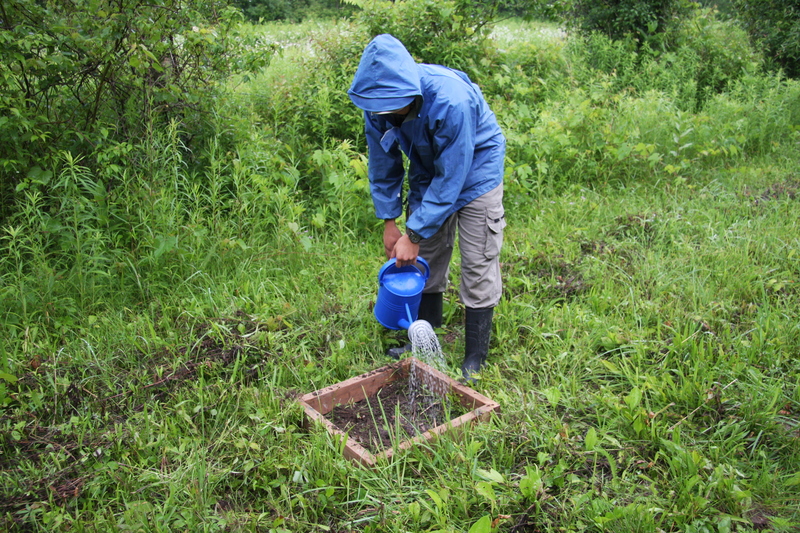 After sprinkling some mustard solution onto our plot, we collect any worms or other invertebrates for 15 minutes. Following this we pour some more mustard and collect for another 15 minutes. The inverts are stored in a jar of ethanol and taken back to the lab for some DNA barcoding! Hello again everyone! I’m going to talk to you about the most recent trip the BIObus and her crew went on, where we had a ‘base camp’ in the Pinery, and explored a variety of management and conservation areas within the Ausable Bayfield Conservation Authority (ABCA). The ABCA is an area in Southwestern Ontario, bordering Lake Huron. The ABCA encompasses drainage basins from a variety of large rivers and streams that are draining directly into Lake Huron, so the ABCA was originally formed in 1946 to deal with flood control, soil erosion, and water supply and quality. It currently boasts a population of 45,000 in its 2,440 square kilometer range, and is a beautiful area to visit. Upon exploring their brochures and website you learn that their primary goal is to make sure that the massive watershed is restored, protected, and conserved in such a way that it is beneficial to all species that live there (including people!). The BIO team recently began aquatic invertebrate sampling and soil invertebrate sampling within a few areas in the ABCA. Our first stop was Clinton Conservation Area which is 250 acres of nature trails, reforestation area, and prime wildlife habitat. 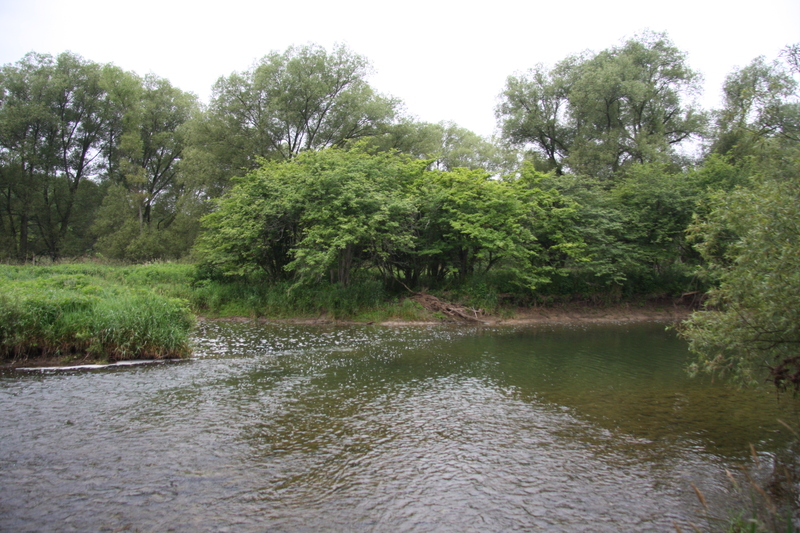 The Bayfield River was where we began our aquatic sampling, and the soil invertebrate sampling began in the immediate vicinity. The vegetation around the river was healthy and dense (making it a challenge for our crew to get set up and sampling), and we were able to collect a diverse amount of invertebrates from the soil. I was actually in waders in this particular location. 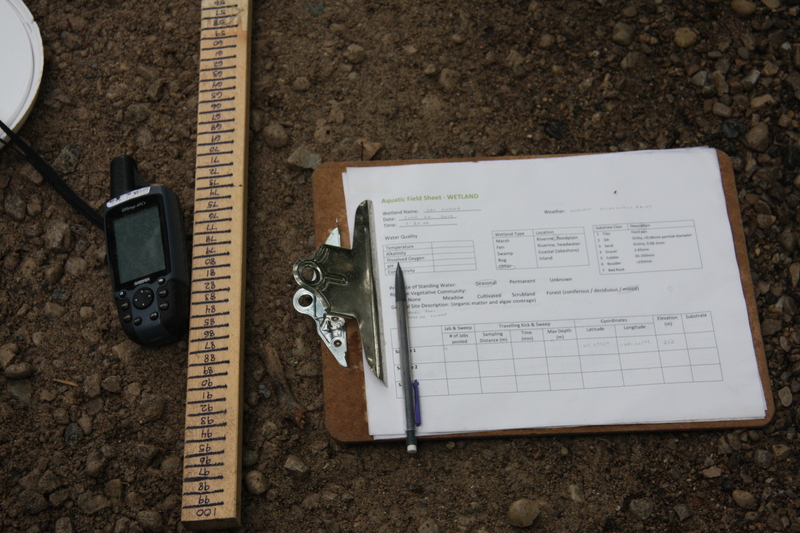 We needed to sample in a pool (a non-turbulent area of the river) and two riffles (a very turbulent area of the river). I started downstream in a riffle site (so as to not disturb the sites upstream from myself) and began sampling with a Dip net. I had to re-trace the sample site a few times to make sure I reached 100 animals from the site. We had to keep trying, as it is hard to determine the actual quantity of animals you have. Animals that can be seen easily with the eye we call “macros”, and animals like Ephemeroptera (mayflies) are easy to count, but small annelids and mites are almost impossible to distinguish from floating debris and swirling dirt particles. We then moved to the pool site and repeated the process, and finally into the last riffle site. So with our total animal count of 300 from the river we packed up and moved on! Unfortunately this site was absolutely swarming with mosquitoes and our whole team received multiple bites, despite being coated in layers of clothing and bug spray. Our next site was a swampy area in a ditch by the side of the road, where Joey hopped in and began jab and sweep sampling, and I recorded all site-pertinent information. We record GPS location, temperature, site description and details, vegetation types and sampling time (all on the go), so I was busy! It rained on and off but thankfully we have waterproof paper to write on! The ABCA has offered beautiful sampling locations and we enjoyed discovering what lives in these managed areas!